Editor’s Note: the album release carnival discussed in this feature has already taken place; check out Plankeye Peggy’s other live dates here. “We don’t want people concentrating on how many key changes we go through, the whole prog rock thing,” says Dave Gilbert, guitarist in Asheville, North Carolina-based Plankeye Peggy. “That’s not really the crowd we’re trying to reach.” Songwriter and keyboardist Danny Tetrault concurs: “Our music is extremely composed, and actually really hard to play. But we want to put on a really fun rock show; we want people to come to our shows a second or third time and still be very surprised.” The audience should expect the unexpected at what Plankeye Peggy is billing not as a party, but rather an “album release carnival” on Friday, March 18 at the Mothlight. That’s not likely to happen, especially at the album release carnival. Gilbert says the band wants to “break down the separation between band and audience.” To that end, the interactive evening will include a wild array of guest performers. In addition to opening act Wasted Wine, the evening will include a simultaneous performance by the Discordia Arts dance troupe. “They’ll also be performing with us,” Tetrault says. That phrase is also an accurate description of the Plankeye Peggy sound. Explaining just one of the new album’s ten songs, Tetrault says, “It goes into a kind of old-school 12/8 soul section. And then the outro is a kind of spacey synth thing.” Let’s See What We Have Here also features an up-front horn section on half of its tracks. 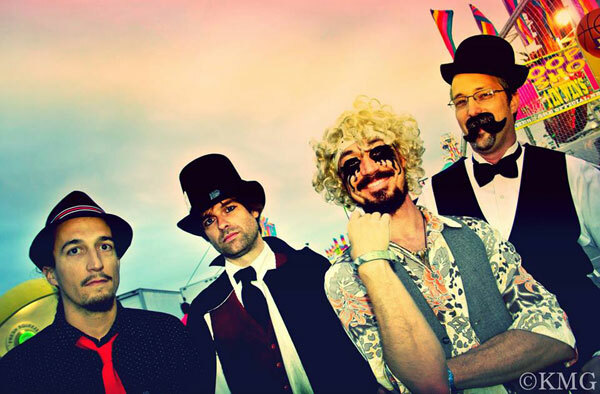 Gilbert admits, “If we had more time, every song [on the album] would have had horns.” For the carnival, the group will be joined onstage by Chaz Burchill (sax) and trumpeter Joseph Dowdy. One might well ask what the audience is supposed to do amid all the planned activity at the carnival. “We try to get ’em dancing,” says Gilbert. “It’s not always the easiest music to dance to, but we promote the waltzes.” So carnivalgoers can expect music in 12/8, waltzes, clowns and jugglers, and … cross-dressing musicians. “We cross-dress all the time,” Gilbert says. “We like to take the whole male-female thing and smash it together.” Though they admit they haven’t had much luck so far getting audiences to show up in costume, Gilbert and Tetrault heartily encourage anyone who wants to do so.